As with many new Google services, the ability to search for products at local stores is a little slow out of the gate, but the potential is there. Google's local product search allows phones running Android or Palm WebOS and the iPhone to see whether nearby stores have the item you're looking for in stock. After searching for a product under the “Shopping” tab on Google's mobile Web site, you can designate an address or use your current location to see which nearby retailers carry the product. But after briefly playing around with the service on my iPhone, I can't say I'll use local product search on a regular basis unless a few things improve. First, there aren't many stores participating right now. 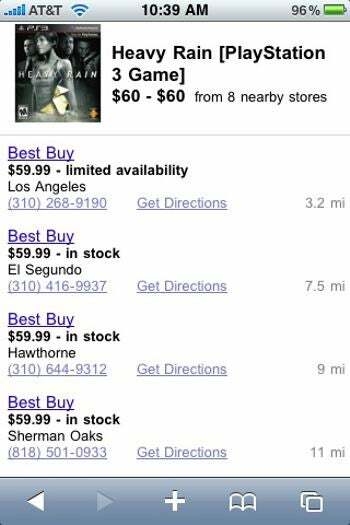 If you're looking for electronics or video games, your options are Best Buy and Sears. Google has posted a sign-up form for retailers who want to participate, so hopefully some other stores will take part soon. A more pressing concern is that some of the participating stores didn't show up in my searches. 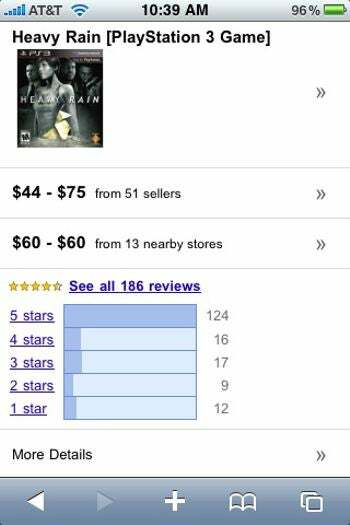 When looking to see which nearby stores had the Playstation 3 game Heavy Rain in stock, Google didn't show results for two of the Best Buy locations closest to me. The same thing happened with Sears when I searched for Wii Fit Plus. Google would've sent me on twice as long of a trip if I didn't know any better. Also, it'd be great of Google let you search for categories of products without breaking everything down into specific items. For instance, let's say I search for party supplies. Instead of showing me all sorts of random products, I'd like to see a list of nearby stores that carry party supplies, so I'd know where to shop. Maybe that's beyond the scope of what Google wants to offer, but it'd certainly be helpful. Google's local product search is a great idea, but it's clearly a work in progress.